On the day of the outbreak Morgan's husband attacks her. He was once a loving man, but has now turned into nothing more than a monster. Morgan escapes her home and is full of fear when she finds out that the world will never be the same again. Morgan only has one thing in mind and that's to get to her family. She needs them more than ever and they need to pull themselves together to find a way out and to survive. Who will make it out alive? And who will have what it takes to stay sane in a world filled with madness? When Morgan and her family find a relatively safe place they start building up some kind of a life again. They have to go out for necessities and go on runs to stock up on supplies. Sometimes they also find other survivors. Morgan has lost so much already and this is taking its toll on both her and the others. They have to rethink their strategy and determine if their sanctuary will hold or if they have to find a new safe haven. When danger lurks around every corner, strength comes in numbers. Who will last to see another day? Morgan is a survivor from the start. She escapes the almost deadly attack from her husband and faces the dangers outside without hesitation. Morgan surprised me with her strength and after getting to know her mother it is obvious that she had an amazing role model. I love to read about ordinary people who show how extraordinary they are in unusual situations. I connected with Morgan straight away and I wished for her to become the leader she's destined to be. 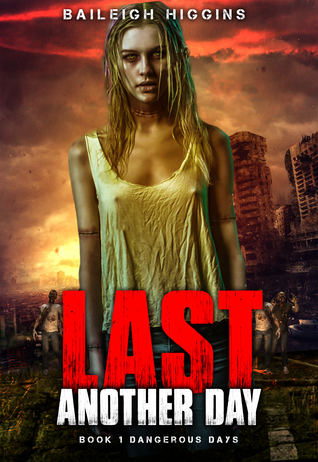 Last Another Day is a jaw-dropping story about surviving in a zombie infested world. Baileigh Higgins skillfully makes her characters believable. They all could easily have been my next-door neighbors. I was so invested in this story that my heart was literally racing during the action-packed scenes. I don't think that there are many zombie stories out there that feel just as realistic as this one. Last Another Day is the perfect start of a series and I think it's brilliant. 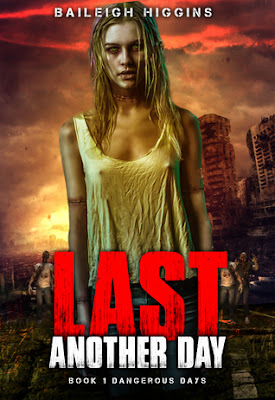 If you love the post-apocalyptic and zombie genre I highly recommend Last Another Day. Last Another Day ends with a spectacular cliff-hanger, keep that in mind when you start reading this book. Cat is a young girl who's living a normal and predictable life. When she's on her way home from school she sees the dead rising again. Not hanging around to become the next victim Cat rushes home. Cat's mother never made it back, so Cat is worried sick because she has no idea what has happened to her. Cat packs a bag with everything she needs and decides to face the dangers outside in the hope to find her mother. During her search for her mother Cat rescues two young children. These children need her to stay alive. What will Cat do now that she has other people to worry about? Cat has never been in danger before. She and her mother are very close and the thought of never seeing her again is almost unbearable for Cat. With the infection spreading fast Cat has to find a place where she can rest and refuel her energy. Cat is extremely responsible for her age and I loved reading about how she steps outside her comfort zone. She's a smart young lady and I liked to read about her journey a lot. Cat's Eye is a short zombie story about a young girl that needs to grow up fast. Cat is a compassionate person, but she learns quickly that she has to make tough decisions to survive. In a world filled with walking nightmares there's no room for doubts and fears have to be put aside. I loved that Baileigh Higgins has written such a scary story about a teenage girl. Cat's Eye is terrifying and gripping. I'm happy it's part of a series and I can't wait to read more. 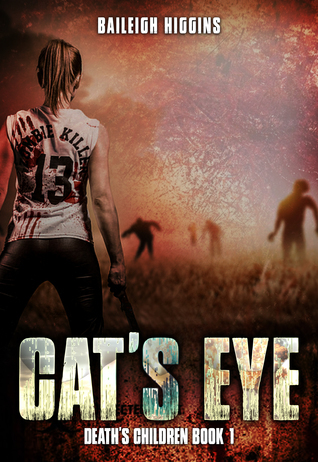 If you're a fan of the zombie genre Cat's Eye is a story you shouldn't miss. Cat's Eye is the first part of the Death's Children series. If you sign up for Baileigh Higgins's newsletter you will get the first three books in her zombie apocalypse Death's Children series for free, plus you will be notified when she has a new release, promotion or giveaway. 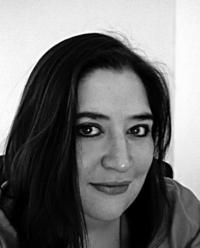 I'm a South African with a love for the sun and nature and a penchant for coffee, pizza, and koeksisters. I'm married to my best friend and partner Brendan Higgins, and we love going to our local pub with friends. Love, of course, and a good scary movie! Mmm, I have a real fear of demonic spirits such as in The Exorcist. I can hardly bear to watch! I'd race around collecting loved ones and getting them to safety. That's what matters the most to me. Ooh, that's a tough one. There are so many! The Grudge, The Descent, 28 Days Later, Dawn of the Dead, Zombieland - these are just a few of my faves. To wake up one day to realize I've wasted my life and done nothing worthwhile with the time that God has given me. If Last Another Day was turned into a movie, I'd like Chris Hemsworth to play Max, Adrianne Palicki to be Morgan, Michelle Pfeiffer to play Julianne, Sean Bean as Breytenbach, and finally Karl Urban as Logan. All simply because I think they're a good fit for my characters. My own love of the books and movies and the heart-pounding emotions they invoked in me inspired me to create my own. It reveals the absolute horror hidden beneath the surface which is terrifying, but it also makes us grateful for the beauty that stands against it and the hidden depths of goodness we possess. Many, many more books to be sure! I'm currently working on finishing my ongoing three series, two of which are zombie related and the other which is dystopian. After that, I'm planning to write a werewolf apocalypse followed by a trip to hell. And I might have a death story brewing somewhere in my brain as well, lol! One very lucky reader of With Love for Books will receive a $10 Amazon gift card and digital copies of Last Another Day, Survive Another Day and Die Another Day. I'm a big fan of the zombie genre. Last Another Day & Cat's Eye sound like a new and unique approach. 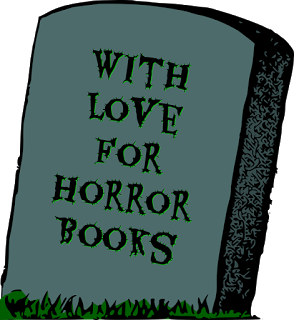 I enjoy finding new authors in the horror genre and have added Last Another Day and Cat's Eye to my tbr list. Thanks for sharing. Loved the interview and review, thank you. I just got one of her books. This is a favorite genre of mine and excited to start reading. I used to read horror books when I was younger, books are better than the movies of them. The premise of your trilogy is right up my (thankfully not zombie infested) alley! Thanks for introducing me to this new-to-me author, Anniek! This story looks imaginative and absorbing! I love post apocalyptic horror!!! These look great! Not the first time a husband turned into a monster but these are trying times. I love zombie stories, this sounds like a really gripping read, looking forward to reading it. I love how you've already picked out actors to play the parts in your book! I can only wish it comes to that...movies and all. Apocalypse aside, this sounds like relatable story. Congrats on your publication. I've been a little obsessed with apocalyptic theme since getting hooked on Walking Dead. Why thank you! :) I became obsessed when I first read Rhiannon Fraters zombie books. Great Cover Art! looks like a great set of book.